Jenny Hutchinson. Custom Airbrush Artist. [ HTML Version ] - If you have the Flash browser plugin installed we recommend you view the Flash version of the site. 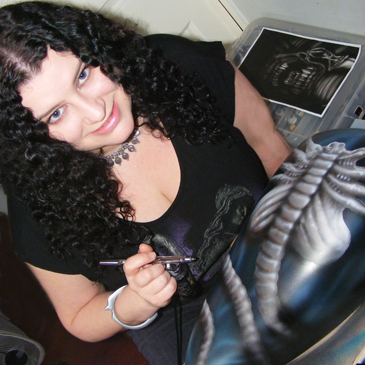 I am a freelance artist and I specialise in painting and airbrushing. I live in a village on the outskirts of Wakefield in West Yorkshire. 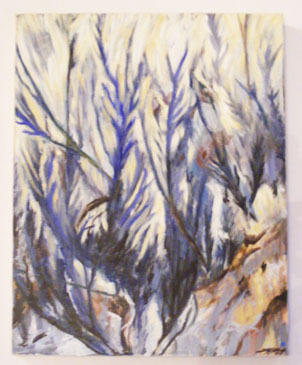 I have been a practising artist since 2003 when I graduated with a first class honours degree from Central Saint Martin’s College of Art and Design in London. During my degree, and throughout my work since, I have developed an excellent understanding of design, shape, colour, texture and light, and this is reflected in the quality of my work. I have had several exhibitions of my work in London, Sheffield, Leeds and Wakefield, and I am always looking for new subjects or challenges to broaden my skill base. 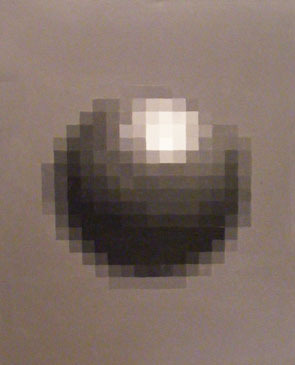 I am a skilled acrylic painter and have applied these skills to my more recent airbrush artwork. I always use high quality equipment and paints (e.g. Auto-Air Colours). My airbrush of choice is the professional IWATA HP-BCS dual action airbrush, which gives me the ability to work in very fine detail. I believe that the airbrush compressor is just as important as the airbrush itself, and so I use the professional IWATA Power Jet Pro air compressor. I work in a variety of media; acrylic, ink, pencil, digital, to name a few! 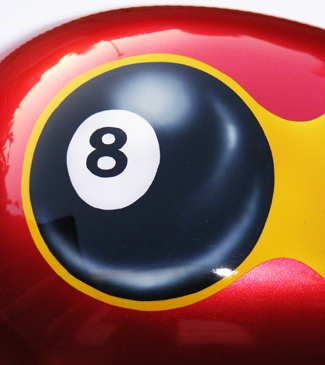 And on a variety of materials; metal, canvas, wood, plastic, fibreglass, the list goes on… I have found that many things can be customised using an airbrush, e.g. 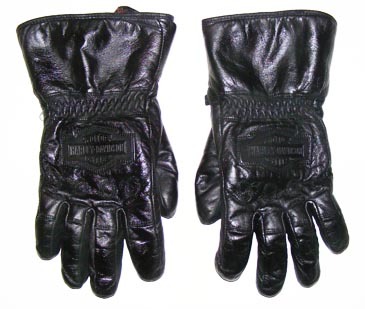 motor vehicles and accessories, instruments, computers and peripherals. If you are unsure about customising an item, please ask me. View my GALLERY pages to see the high quality of my work, and my TESTIMONIALS pages to hear from happy customers. Also take a look through my FOR SALE section to see some of my original art works which could be yours to own. Whether it’s an item you need customising, a bespoke piece of art, or just a question, I would love to hear from you! 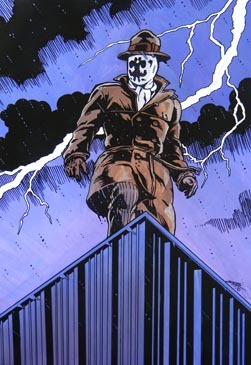 A reproduction of Dave Gibbons’ original artwork from the Watchmen comics, depicting Rorschach in a thunder storm. Hand painted using acrylic paint and permanent marker on an MDF panel. 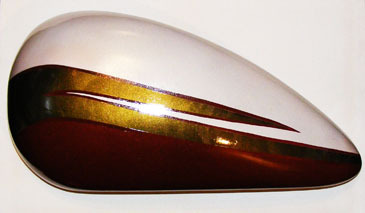 Stylised golden stripe with a brushed metal effect, with burgundy and white pearlised paint top and bottom. 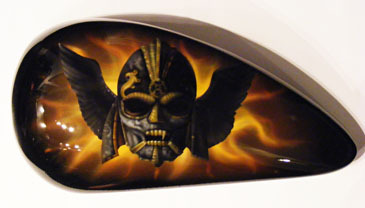 Hand airbrushed on a fibre glass half tank using Auto-Air Color paint and multiple masks. 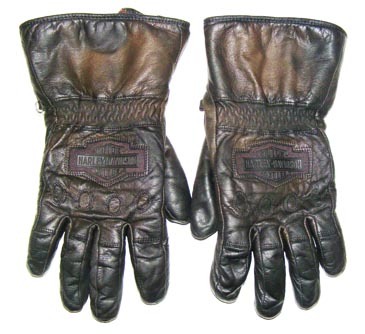 Giving faded, old gloves a new lease of life with a dose of black Createx leather paint and a top coat of gloss Createx leather paint to give a shine. 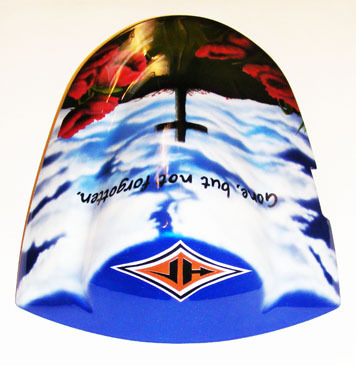 A fibreglass seat hump depicting a cross on a field with poppies and the words “Gone, but not forgotten.” Jim was kind enough to let me airbrush my logo onto the rear of the seat hump. 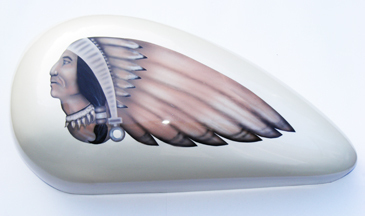 Airbrushed using Auto-air Color paint and multiple masks, with the sky colour blending to become the colour of the bike. Finished with clear-coat and polished to a high shine. 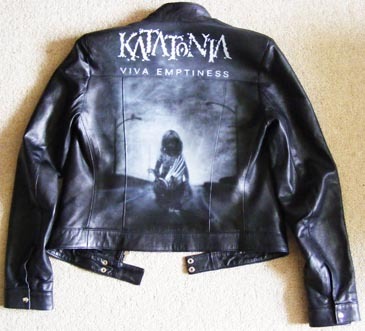 Hand airbrushed leather jacket depicting the album cover Viva Emptiness by Katatonia. 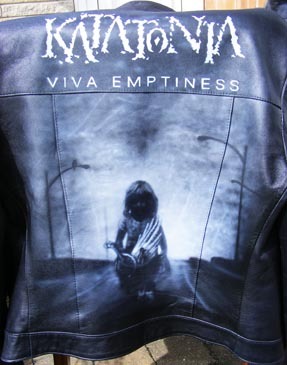 Airbrushed onto leather using Createx leather airbrush paint, including freehand and masked areas. Finished with a leather matte and gloss top coat, to give a soft sheen. 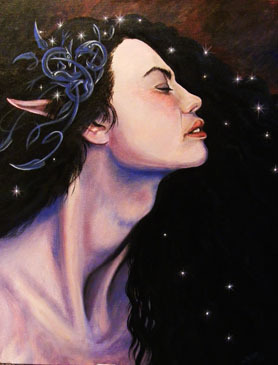 A reproduction of Brian Froud’s famous painting Morgan Le Fey. 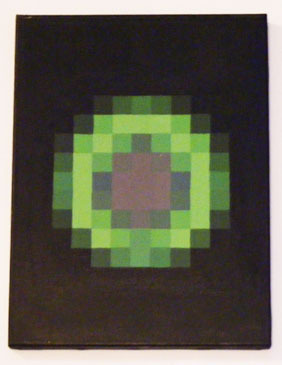 Hand painted using acrylic paint on a stretched canvas. 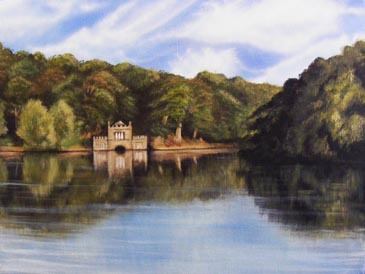 Painting depicting the woods and Boathouse on the lake at Newmillerdam, Wakefield. 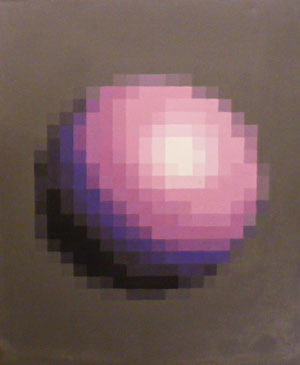 Hand painted using acrylic paint on a stretched canvas, with an airbrushed sky using Auto-air Color paint. Painting depicting the Playa Del Conde, Torre De La Horadada, Spain, at sunset. 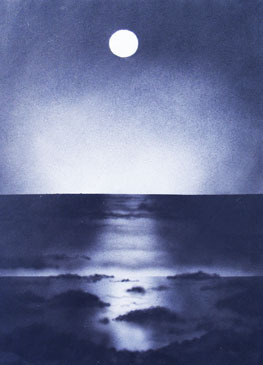 Hand painted from a photograph, using acrylic on an MDF panel, with an airbrushed sky using Auto-air Color paint. 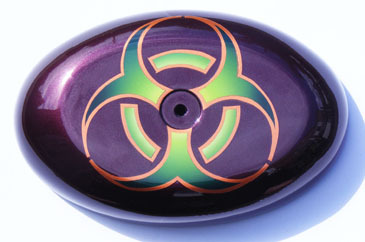 Stylised green Bio-hazard symbol, with copper detailing, on a pearlescent purple basecoat. Hand airbrushed on a fibre glass air filter using Auto-Air Color paint and multiple masks. 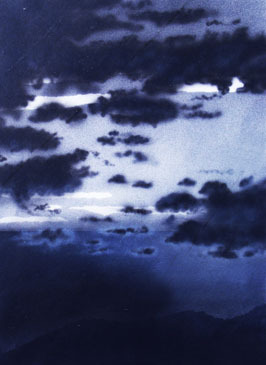 Airbrushed skyscape painting, depicting white clouds disappearing towards the horizon. 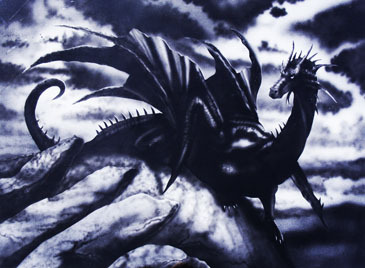 Hand airbrushed on an MDF panel 30x82cm. 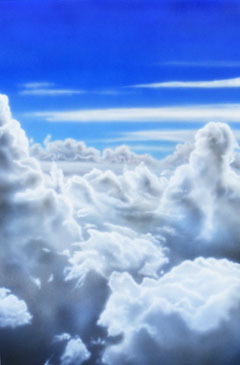 Airbrushed skyscape painting, depicting white clouds disappearing towards the horizon, from an aerial perspective. Hand airbrushed on an MDF panel 40x60cm. 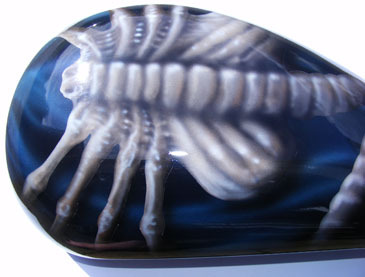 Stylised Facehugger from the film “Alien”, painted on a matte black basecoat with a blue/green mist behind. 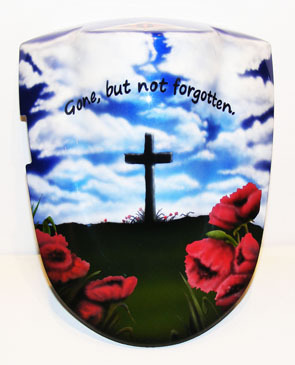 Hand airbrushed on a fibre glass half tank using Auto-Air Color paint and multiple masks. 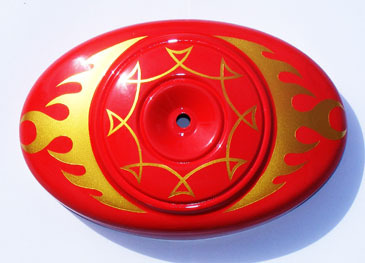 Stylised air filter design (reminds me of Flash Gordon! 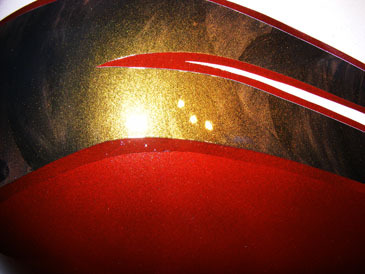 ), with gold detailing, on a matte red basecoat. 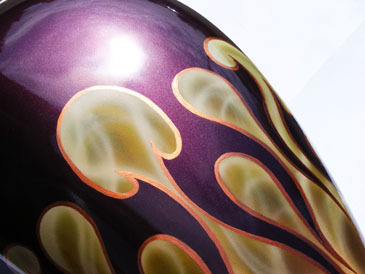 Stylised pearlescent purple flames, painted on a flaming basecoat with a copper edging. 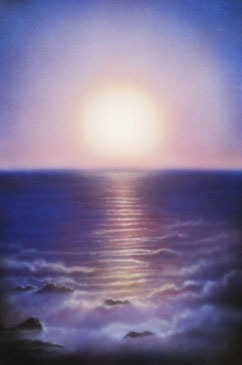 Airbrushed skyscape painting, depicting the sun setting over the sea with mist rolling at the shore. 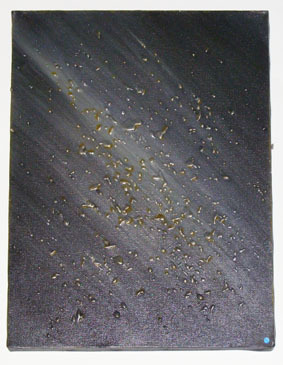 Airbrushed monochromatic skyscape painting, depicting storm clouds. 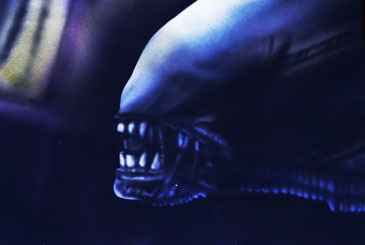 Hand airbrushed on an MDF panel 82x30cm. 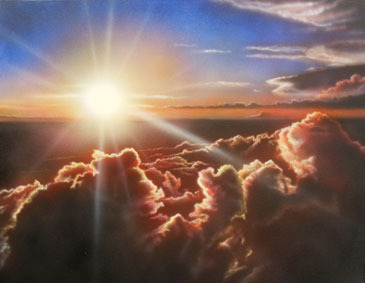 Airbrushed skyscape painting, from an aerial perspective, depicting clouds disappearing towards the horizon, illuminated by the setting sun. 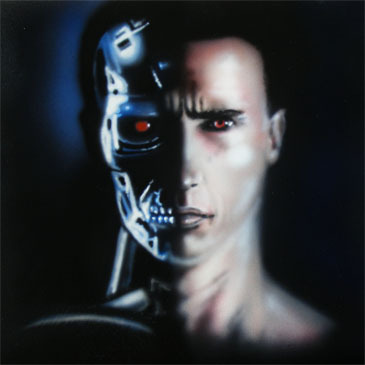 Hand airbrushed on a stretched canvas 76x61cm. 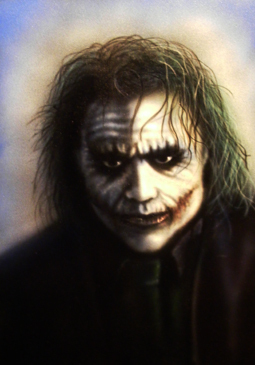 Classic image of Heath Ledger's 'Joker' from 'The Dark Knight'. Airbrushed on MDF using Auto Air Color paint. Inspired by the painting Draco-Rex by Ciruelo. Hand airbrushed on a steel plate using Auto-Air Color paint and multiple masks. 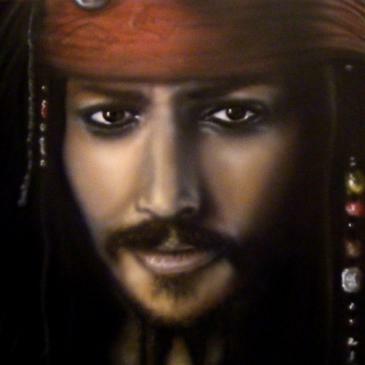 Classic image of Johnny Depp's 'Jack Sparrow' from 'Pirates of the Caribbean'. Airbrushed on steel using Auto Air Color paint. 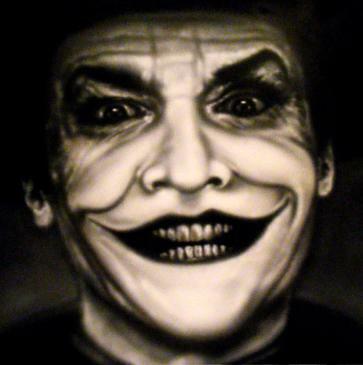 Classic image of Jack Nicholson's 'Joker' from 'Batman'. 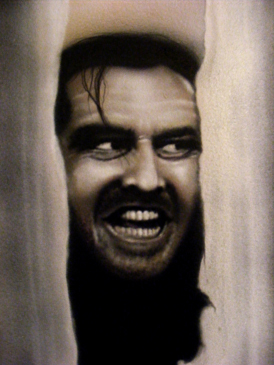 Iconic image of Jack Nicholson in 'The Shining'. 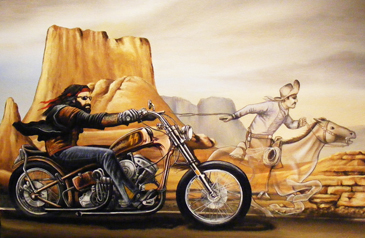 A study of the late David Mann’s famous painting. Hand painted in acrylic on MDF, finished with clearcoat. 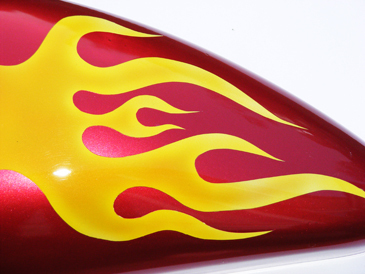 Stylised Alchemy Gothic motif Ossa Ravenhead, painted on a black basecoat with a burst of flames behind. 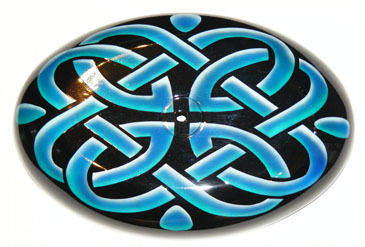 Stylised blue Celtic knot on a black basecoat. 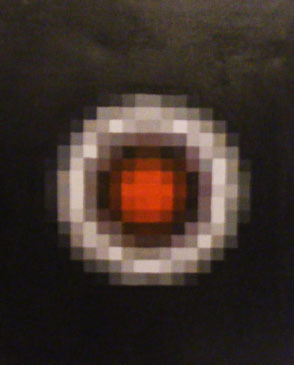 Painting inspired by the film The Terminator. 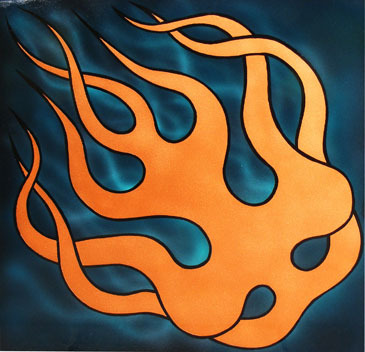 Hand airbrushed on a steel plate with no masking, using Auto-Air Color paint. 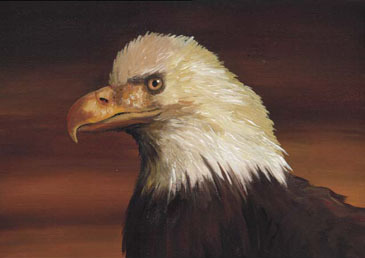 Acrylic painting of an American Bald Eagle, with a piercing stare. A hand painted recreation of a classic Spawn comic-book image, on a large scale canvas.Acrylic on stretched canvas. 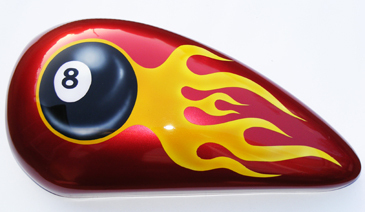 Black 8 ball with metallic stylised flames, on a pearlescent red basecoat. 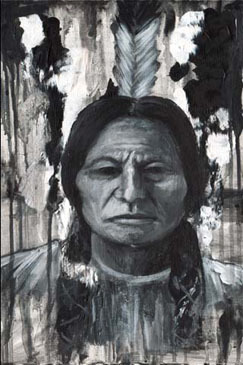 A monochromatic acrylic painting depicting a native American Indian Chief. 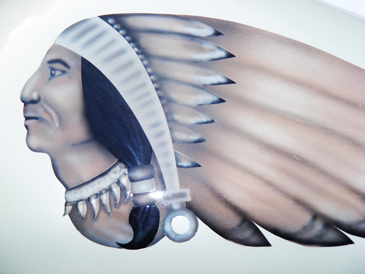 Stylised Indian motif painted on a pearlescent white basecoat. 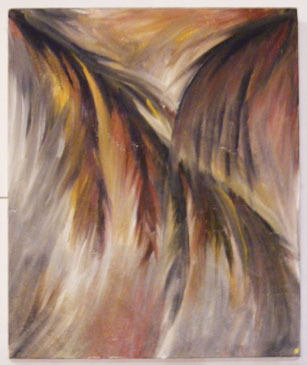 A fantasy style painting depicting a white angel/demon flying through a turbulent sky. 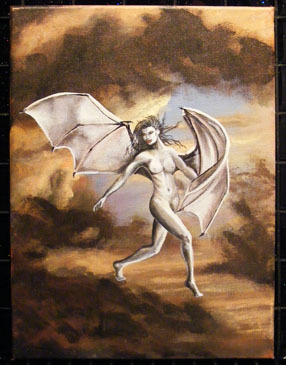 Monochromatic painting of a vampire. 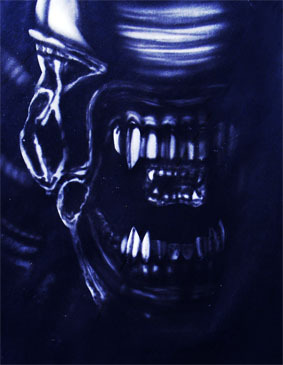 Monochromatic painting inspired by the film Alien. 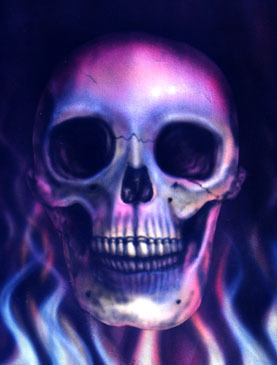 Hand airbrushed on cartridge paper using acrylic paint and multiple masks. 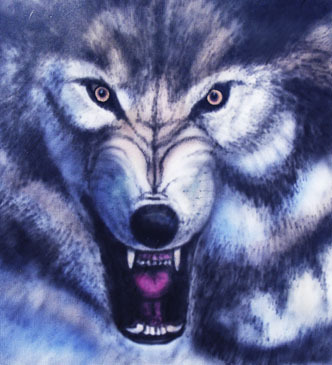 Painting of a wolf snarling. 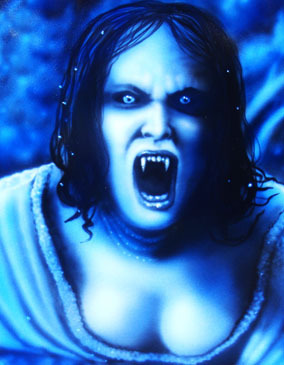 Hand airbrushed on cartridge paper using acrylic paint and no masks. 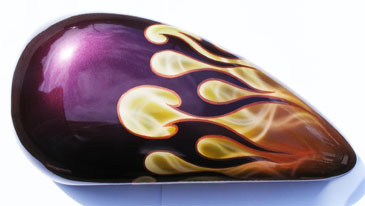 Flames painted on a black basecoat. 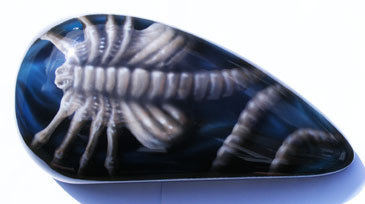 Hand airbrushed on a fibre glass half tank using Auto-Air Color paint and no masks. Inspired by the painting Darkdsurion by Ciruelo. 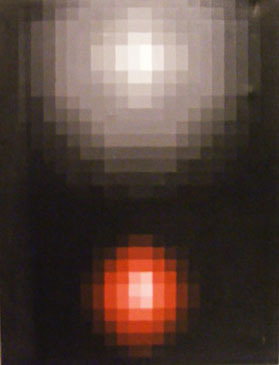 Large scale acrylic painting in my “Pixelated” style. Each square is hand painted individually to give the overall effect. 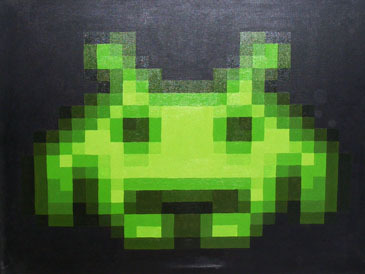 A fun, retro style acrylic painting in my “Pixelated” style. Each square is hand painted individually to give the overall effect. 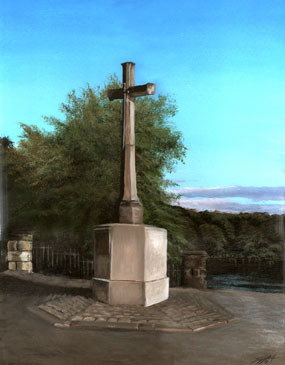 A traditional acrylic painting of the war memorial at Newmillerdam, Wakefield. 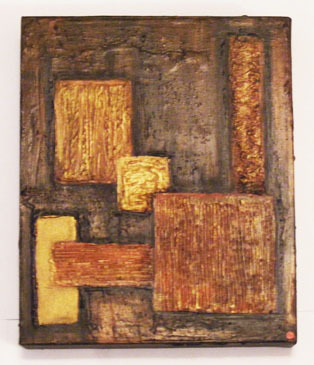 Acrylic on stretched canvas, hand framed in a stained pine frame. 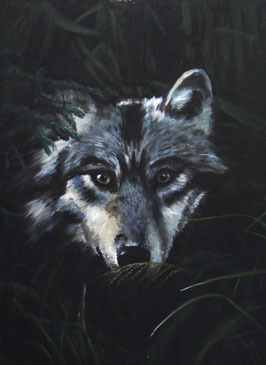 A traditional painting of a wild wolf gazing through the darkness of the forest. 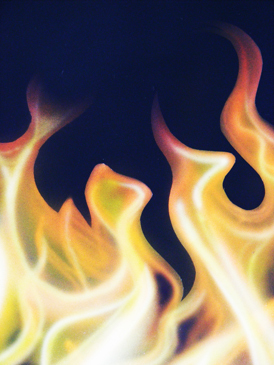 A painting of realistic flames. 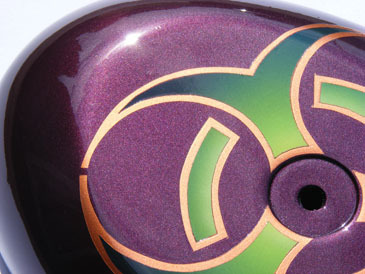 Metallic copper stylised flames with black edging on a green/blue smoky base. "I commissioned Jenny to create a challenging piece of bespoke artwork. She dealt with the challenge flawlessly and produced a piece of work far beyond my expectations. I would not hesitate in recommending her to any one; both her work and her business manner are first rate. "...I had this piece commissioned for a friend and was thrilled with the result! You have an incredible natural talent when it comes to artwork. I cannot praise your work enough, and I am very happy with your professional service. Worth every penny!..." "...I was looking for some art work to hang in my games room. A friend of mine gave me Jen’s details and suggested I give her a call. I told her the type of theme I was looking for and that I wanted it to be a car / bike related piece. When she showed me the finished design I couldn’t believe it. The finished piece is absolutely great and really looks spot on." "...I was really impressed with the professionalism and the excellent quality of Jenny’s work. 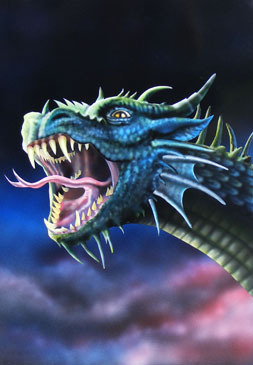 The dragon I commissioned her to paint for me was fantastic; I will defiantly use her again!..." 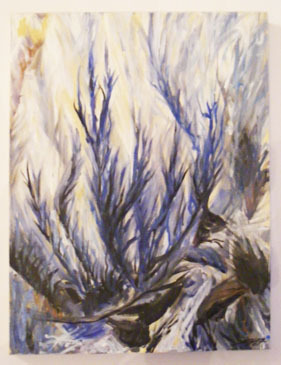 A naturalistic abstracted painting with cool wintery colours. 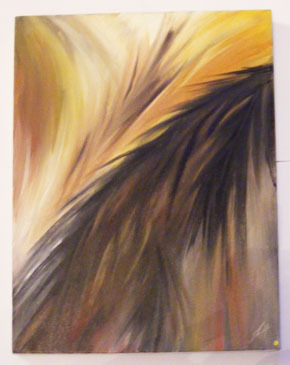 A naturalistic abstracted painting with warm colours. 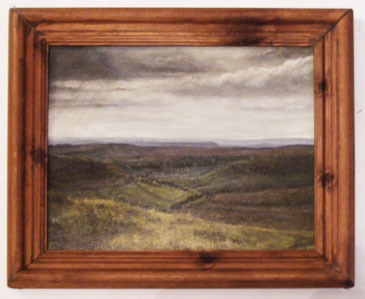 A traditional painting of the North York Moors in winter. 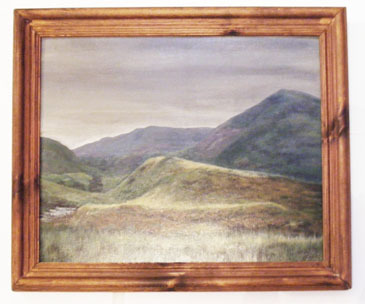 Acrylic on canvas panel, hand framed in a stained pine frame. 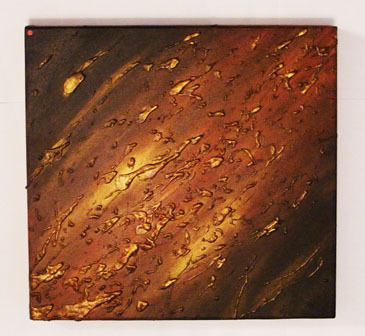 A highly textured and metallic modern art piece. 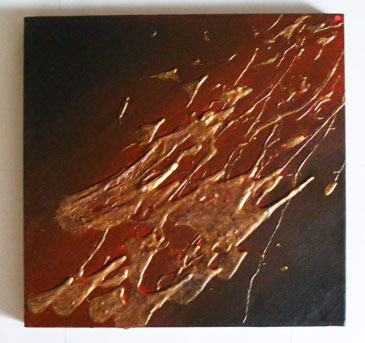 A highly textured and metallic modern art piece with warm red and gold colouring. 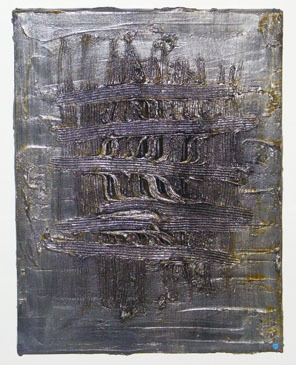 A highly textured and metallic modern art piece with cool grey and silver colouring. 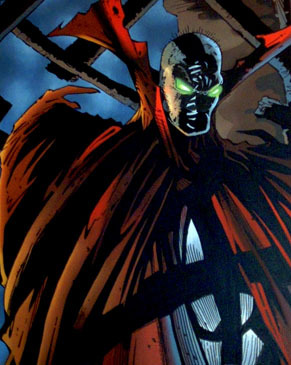 A hand painted recreation of a classic Spawn comic-book image, on a large scale canvas. 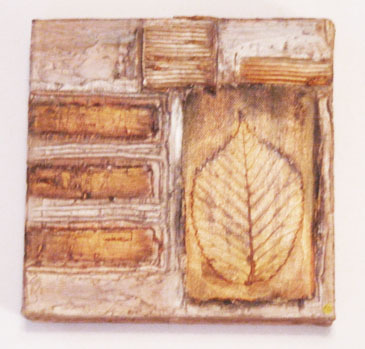 A highly textured, metallic, modern art piece with a real leaf embedded in the paint. 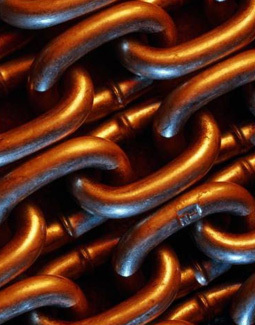 Warm, copper and brown colouring. 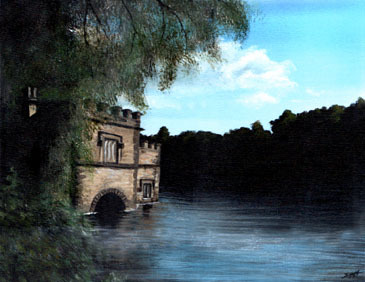 A traditional acrylic painting of the boathouse at Newmillerdam, Wakefield. I prefer to correspond with each client on a personal basis, as each job is bespoke and each customer is individual. So please contact me for a quote, including what you are looking for and how quickly you need the work completing. Design is a vital part of the art process, and as such I will not undertake any practical work until designs have been authorised by you. This eliminates any confusion and ensures that you get what you want! 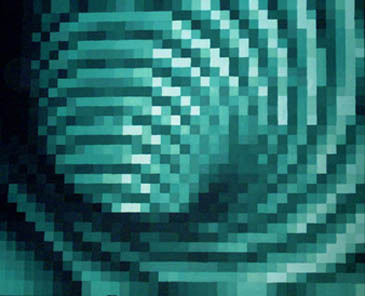 The creation and finalisation process of images and designs to take forward to the “Art” or “Airbrush” zones. All work that I undertake will include elements of the Design Zone until you and I are happy with the proposed work. • Digital image creation, including Photoshop and Flash designs. 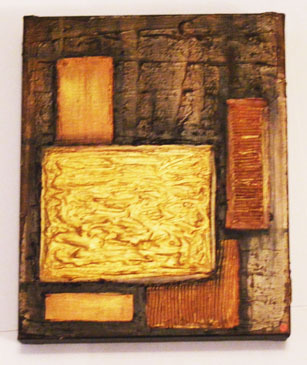 The Art Zone includes the creation of bespoke artwork on your choice of materials (including canvas, wood and paper). This zone is for all your more traditional artwork needs. I work in a variety of ways to suit the client and can create work in a variety of styles; modern, traditional, portraits, photo-realistic. 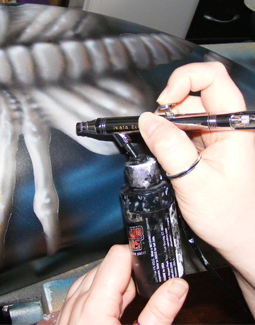 Whether it’s customising an item or creating artwork using an airbrush this is the zone for you! I work with professional equipment and media. I use “Auto-air Color” paint, which comes in an extensive variety of colours and effects, including pearlescent and metallic finishes. Please go to my links page where you can view the range on their website. Shipping costs are dictated by the size, weight and destination of an item, so these will be calculated on the completion of a project. However, indicative quotes can be obtained prior to this if requested. I only use professional couriers so your item can be tracked all the way to your door! 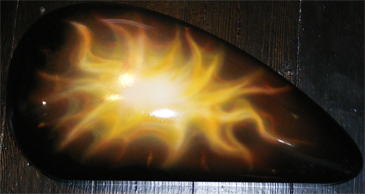 Some airbrush work needs extensive preparation and finishing work. I am an artist and do not consider myself a mechanic, so I will have any body or finishing work undertaken by professionals for your peace of mind. Estimated quotes may vary from final charges due to unforeseen circumstances, but I will inform you every step of the way to resolve any problems. Please do not hesitate to contact me if you need any more information or would like to discuss a potential project.